Welcome to Kuzina! 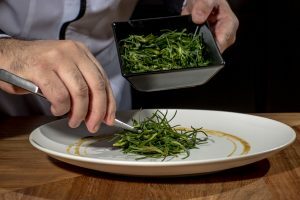 Together with my collaborator, Chef Giannis Vidalis, inspired by our experience in every corner of the globe, we invite you to taste exclusive dishes made with the freshest ingredients, combined with passion and imagination. Enjoy modern Greek recipes as well as exceptional sushi, with the Cycladic beauty of the beach of Ornos as a backdrop.